The Sixteenth Thursday of Ordinary Time. The Memorial of Saint Sharbel Makhlûf, Priest. 9:44 AM 7/24/2014 — One of the few things I remember from my elementary school days was the time we raised some chicks in the class—I think this was in first or second grade—in an incubator. When the eggs finally began to hatch, our teacher warned us not to succumb to the temptation to help the bird out of its shell; the struggle to peck its way out of the shell was a necessary process which helped the bird to develop the strength it would need to survive. Take that away and the bird would be born weak and unable to survive on its own. 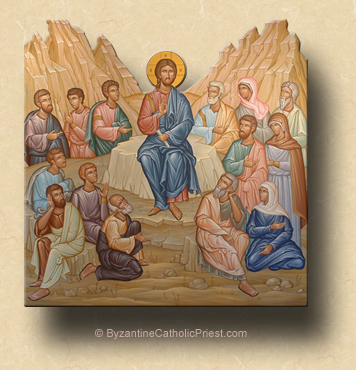 Today's Gospel lesson is an example of what Scripture scholars call the “messianic secret”: Jesus reveals to his disciples who he is, but hides his true identity to the general public; he speaks to the multitudes in cryptic parables, but explains their meaning to his closest friends in private, leaving everyone else to think about it. The reason for the messianic secret is unknown;—to know it would be to know the mind of God—but, it presents to us a very pleasing image of the camaraderie between our Lord and his first followers. They are a clique in a good sense of that word; they are friends. What they share among themselves they keep to themselves. This episode occurs in Matthew's Gospel, but it reminds us of an incident in chapter 18 of Luke, wherein our Lord encounters a rich young man who wants to join his company. Our Lord offers him the chance, but requires him to sell all his possessions first, and he ends up walking away sad. We interpret that passage as a warning about how worldly concerns can keep us from union with Christ; but, there's a subtext to that passage which often escapes us: why is the rich young man attracted to Jesus? Obviously he's observed our Lord for some time, seen the camaraderie that his closest friends enjoy with him, and wants to belong; but, in order to belong, he has to do what the others have done, namely, sell all he has and give to the poor. Had our Lord let him join anyway, he wouldn't have fit it, because he wouldn't have been through what the other disciples had been through. Since our Lord's resurrection and ascension into heaven, the camaraderie of discipleship is offered to all who seek our Lord, but it's a shame that the disciples didn't recognize what they had when they had it; otherwise they wouldn't have asked our Lord in today's Gospel why he was speaking in parables. But there is a sense in which we can enjoy what they had but failed to appreciate. We are a minority, those of us who follow the Lord. The world around us knows nothing of what we know as people committed to our Faith. Even within the family of the Church we often feel ourselves set apart from the multitudinous throng that flocks to its parish churches on Sunday to fulfill an obligation or simply not give bad example to their children, and which shuffles forward like lemmings to receive Holy Communion with nary a thought about what it is they're actually presuming to receive. We observe that and it makes us sad, sometimes perhaps even angry, but that's the wrong attitude to have. What we should want is for them to have what we have: a real friendship with Christ, a real desire to be with him in the Blessed Eucharist, not because it's Sunday and we have an obligation to fulfill, but because we are his friends, and friends look for every opportunity to spend time together, even setting aside other things to make it happen. St. Josemaria Escrivá, the holy founder of the lay organization, Opus Dei, used to begin every homily with the words, “Dear friends of God....” Of all the definitions of what it means to be a Christian and a Catholic, I think that's my favorite: a friend of God. Let us pray that, unlike our Lord's first disciples, we will not fail to appreciate what it is we have. “And, believe me, there have been many prophets and just men who have longed to see what you see, and never saw it, to hear what you hear, and never heard it” (Matt. 13:17).